“I looked up and how I felt at that moment is very hard to describe,” says Chowdhury. 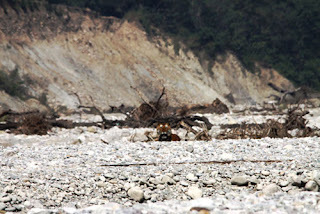 “There was a huge male tiger walking along the river bed. The big cat was only a few hundred meters away from us. After a few seconds of stunned inaction, I began taking photographs. “The tiger spotted us and tried to take cover. It realized there was none, turned back and disappeared into the jungle. This rare sighting of a tiger during broad daylight completely rejuvenated us and we tracked his pugmarks up to our camera point. 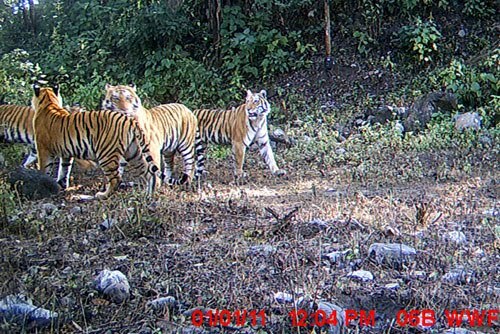 Chowdury’s work is part of WWF’s efforts to provide a safe place for tigers to move freely between two separate habitats. 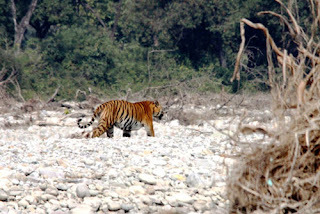 His tiger sighting took place in a corridor where the mighty River Kosi separates the Corbett Tiger Reserve from the forests of the Ramnagar Forest Division. This wildlife corridor is critical for big cats to move between the two places. Results from WWF’s monitoring efforts in the area are astonishing. 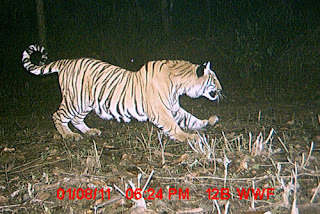 Camera traps confirm that tigers use the River Kosi corridor and that the adjacent Ramanagar Forest Division has the highest density of tigers outside of a protected area in India. 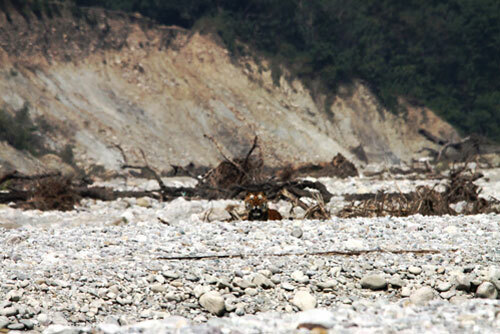 WWF continues to study the pressures faced by the River Kosi corridor. The unchecked growth of holiday resorts in the area is the greatest cause for concern. Because these tigers are roaming through non-protected areas, safeguarding the species and their habitat is urgent.